Your teeth are one of nature’s most amazing inventions. They do their job day in and day out, year after year, yet require only minimal care. Still, nobody’s teeth are perfect, not even those of Hollywood celebrities. One common problem is tooth misalignment, more commonly known as underbite or overbite. Left uncorrected, this condition can cause tooth decay, headaches, neck and back problems, and even worse. Inconvenience. Only a dentist can remove traditional braces once they’re in place. They make many aspects of the patient’s life difficult, including basic tasks such as brushing and flossing. Many braces wearers must give up many of their favorite activities, such as playing certain types of musical instruments. Discomfort. Traditional braces can be very uncomfortable, especially in the weeks and months when the patient is getting used to them. Practical issues. 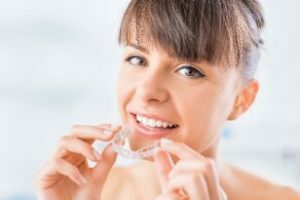 An adult who wears traditional braces may have trouble practicing his or her profession, especially if it involves dealing with the public on a regular basis. Social awkwardness. Braces wearers sometimes struggle with feelings of unease or self-consciousness in social or interpersonal situations. Convenience. Invisalign aligners can remove the appliance for up to two hours per day to eat or to tend to personal needs. There are no wires and no rubber bands to worry about. Comfort. Invisalign aligners work gently and gradually, achieving their therapeutic benefits free of the discomfort associated with traditional braces. Practical benefits. Invisalign aligners are made from lightweight, low-profile, transparent materials. They come with a compact carrying case that travels well. Simply tuck it into a corner of your bag or suitcase and Invisalign can go anywhere you go. Social confidence. Invisalign aligners are practically invisible. You’ll never have to worry about them drawing unwanted attention or making you feel awkward in social or interpersonal situations. Convenience, comfort, confidence, and healthier teeth – it’s easy to see why Invisalign aligners are so popular. Many dental plans cover a substantial portion of the cost associated with Invisalign. In addition, you’ll find financing and payment plans designed to fit most budgets. Ask the staff at your dentist’s office about these opportunities. There is no better present you can give yourself than the gift of better health. Talk to your dentist in Medfield about Invisalign and other treatment options during your next appointment. You have nothing to lose and plenty to gain. Dr. David Hirshfield has been practicing dentistry for almost 40 years. A graduate of Tufts University, he has completed advanced training in many aspects of dental care, including cosmetic, restorative, and implant procedures. You can reach his office online or by calling (508) 359-8822.